Instant-messaging software has evolved into the latest weapon in a fierce battle among major Internet companies to reap revenues off whatever you do, wherever you go online. Many people spend hours a day with messaging programs active, shooting text to friends and co-workers online. These free products already go well beyond the typed word: People can swap files and chat with webcams and microphones. On Monday, Yahoo Inc. launched Internet radio and other new services around its messaging software. Microsoft Corp., meanwhile, is leveraging IM as a subscription gaming hub, while America Online Inc. is packaging weather. "They are becoming much more of a destination as opposed to just a communications front-end," Rob Enderle, an independent analyst in San Jose, California, said of instant-messaging services. "They want to own the user experience." "The more Yahoo services people use, the more loyal they are, the more likely they are to come back and the more likely they are to tell friends," said Lisa Mann, Yahoo's senior director for messaging products. The new Yahoo! Messenger software, available in a "beta" test with a final version due in late May, reconfigures the main window so your list of friends can remain on the screen as you visit other Yahoo services such as news, stocks and calendar. The software adds several free features: You can invite friends to play chess or dominoes. The titles of songs you listen to appear on friends' "buddy lists" next to your name so they can listen in, too. You can perform searches with a co-worker and have results appear on both ends. The integration of search, in particular, could give Yahoo an edge over current search leader Google, which unveiled a Web mail service this month to rival Yahoo's and Microsoft's. Google officials say they have no immediate plans for IM. "Google would be smart to roll out an IM strategy and to do it fairly quickly," Yankee Group analyst Paul Ritter said. But while IM can foster collaboration among co-workers, Ritter said, new features can also create distractions. A February survey by the Pew Internet and American Life Project finds that 29 percent of full-time workers use IM at work. A study conducted last year by Harris Interactive for the Internet filtering company Websense Inc. says one in five workplace IM users populated at least 70 percent of their IM lists with personal as opposed to business contacts. Nonetheless, IM providers aren't shying from new features. 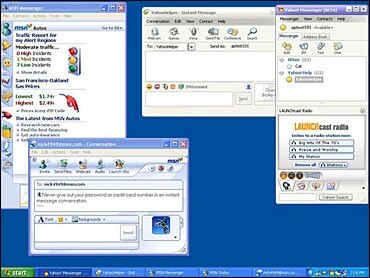 Last week, AOL began bundling WeatherBug with the most popular IM software, AOL Instant Messenger. The company is working to integrate features — for example, issuing localized weather alerts through IM. AOL also lets you obtain movie times, stock quotes, recipes and phone listings for local businesses by sending IM queries to special "buddy" addresses. And paid subscribers can update their AOL Web journals by sending an instant message. AOL's main messaging products — it's the market leader with 44 million U.S. users — have become key delivery platforms, said Edmund Fish, AOL's senior vice president for desktop messaging. "We know that the application is open more than six hours a day per user on average," Fish said. "It's a lifeline." ICQ, a separate service from AOL with 4 million users, last week added its ICQ Xtraz platform for automatically delivering new features such as games, some of which carry a fee. Still missing, though, is a way for users of different services to reach one another directly, just as people can send e-mail to anyone with an Internet e-mail account regardless of service provider or software used. Fish said users haven't clamored for such interoperability as much as other features. Even Microsoft, which once joined Yahoo in a coalition to press AOL for interoperability, is happy to direct the 17 million U.S. users of MSN Messenger to the company's own offerings. So one tab gets you traffic reports and gas prices from MSN Autos; another lets you sign up for news alerts through MSNBC.com, which Microsoft partly owns. The company is testing a companion called Threedegrees, which lets IM users listen to music together or share photos. By early this week, Messenger users can also invite friends to play brand-name games like "Wheel of Fortune" for about $5 a month each. "IM is such a social experience," said Brooke Richardson, an MSN product manager. "We think of these activities and doing things together as a natural extension of messaging."